Uppsala, Sweden / Embedded World, Nuremberg, Germany—February 23, 2015—IAR Systems®, the leading vendor of embedded development tools, proudly present its latest product innovation C-STAT®. The new tool provides powerful static analysis fully integrated with the high-performance development toolchain IAR Embedded Workbench® for ARM®. Static analysis finds potential issues in code by doing an analysis on the source code level. 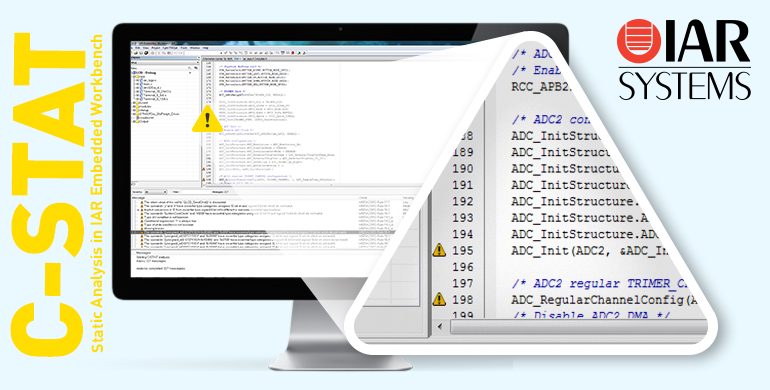 The analysis helps prevents application failure by detecting potential code errors including for example memory leaks, access violations, arithmetic errors and array and string overruns. Because such errors can affect the quality of products as well as cause security issues, it is crucial to find them early in the development cycle and minimize the impact on the finished product as well as on the project timeline. In addition to raising the code quality, the analysis also aids alignment with industry coding standards. C-STAT is a powerful static analysis tool that executes fast and provides analysis results directly in the IAR Embedded Workbench IDE. It checks compliance with rules as defined by coding standards including MISRA C:2004, MISRA C++:2008 and MISRA C:2012, as well as hundreds of rules based on for example CWE (the Common Weakness Enumeration) and CERT C/C++. Users can easily select which rule-set and which individual rules to check the code against. To take full control of their code, developers can utilize C-STAT complemented by IAR Systems’ tool C-RUN® that checks for actual heap and bounds issues at runtime. C-STAT is now available as an add-on product for IAR Embedded Workbench for ARM, version 7.40 or later. The powerful compiler and debugger toolchain supports more than 3,000 ARM-based devices and is also available in a functional safety version with the build chain certified for development according to IEC 61508, ISO 26262 and EN 50128. All products are sold with access to IAR Systems’ renowned technical support available in multiple time zones. Read more about C-STAT at www.iar.com/cstat and about IAR Embedded Workbench for ARM at www.iar.com/ewarm. Editor's Note: IAR Systems, IAR Embedded Workbench, C-SPY, C-RUN, C-STAT, visualSTATE, Focus on Your Code, IAR KickStart Kit, IAR Experiment!, I-jet, I-jet Trace, I-scope, IAR Academy, IAR, and the logotype of IAR Systems are trademarks or registered trademarks owned by IAR Systems AB. All other products names are trademarks of their respective owners.